Our friend David Saltman has posted another must read on his blog The Houdini File. This time David shares the results of his investigation into whether it was really possible that young Ehrich Weiss saw the famous English conjurer Dr. Lynn and his famous "Bloodless Vivisection" in Wisconsin in the 1880s. Some great information here, so click on the headline and have a read at The Houdini File...and do try to keep your head! Wow! Another great blog John! Since Dr. Lynn was not in America at this period in Houdini's tween years, it makes sense that this performer was an imitator. I wonder if David found any advertisements for those Milwaukee shows from this imposter. 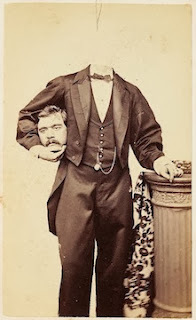 It's doubtful Houdini's father could have afforded the tickets to Dr. Lynn's show. Is it possible Houdini caught Dr. Lynn's show at a later date when he was older and could have afforded to purchase a ticket? Is it also possible that Houdini credited his father for this as he credited Mr. Weiss for other achievements the man did not earn? I believe Houdini. David Saltman has accounted for Dr. Lynn's whereabouts during the entire time frame that makes sense, but, in 1882, Dr. Lynn is in America and three months later, he is England. During that time, there is no advertising or mention of Dr. Lynn in the available Milwaukee papers. But I still believe Houdini. Well, if he was 8, like you mention in The Key, then he could have seen Dr. Lynn some time from March (24th) until May of 1882. I wonder where the age 8 came from? Depending on the source, the ages seem to range from 8 to 12. Of course, if this were the case, he would have still been living in Appleton since it wasn't until December 1882, that Mayer moved his family to Milwaukee. Everything that Houdini has shared about his life has been misdirection. You can never be certain on a story that he has given on how much of it is fact, fiction, or a combination of the two. Case in point, the famous story about Houdini being fooled by the "Bloodless Vivisection". On the same bill, Dr. Lynn more than likely presented his box trick that he copied from Maskelyne. The version is different from the final version Houdini performed as Metamorphosis. Young Ehrich probably was fooled by this as well. And when he saw an outfit for the trick being sold, he tried to buy it only being forced to buy a cheaper one that he could afford. So, once again Houdini used misdirection away from the fact that his Metamorphosis had origins in the box trick he saw Dr. Lynn perform.